The 1st Biomed Leaders' Forum was held at UNIST on Friday, April 14, 2017. Nearly 100 biomedical scientists gathered at UNIST to explore biomedical research collaborations at the Biomed Leaders' Forum. Some of the nation’s top researchers in biomedical industry gathered at the first Biomed Leader’s Forum to exchange their work, ideas and knowledge about biomedical sciences on April 14, 2017. The primary purpose of this event is to further increase research collaborations in the biomedical sciences across the south eastern region of South Korea. 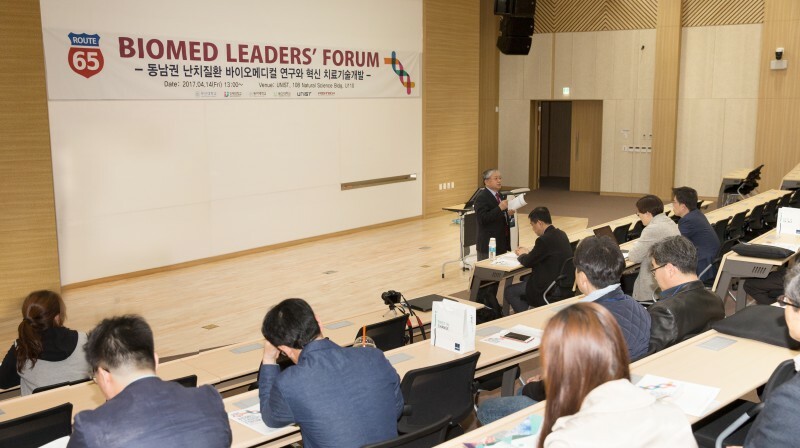 The keynote speakers at the Route 65 Biomed Leaders’ Forum were from world’s leading research organizations under universities that are supported by the Korean government, including UNIST, University of Ulsan, Pusan National University, Pohang University of Science and Technology (POSTECH). Professor Pann-Ghill Suh of Life Sciences is presenting at the 1st Biomed Leaders’ Forum on April 14, 2017. The opening plenary lecture of this year’s forum was given by Director-General Do Joon Park, a world-renowned expert in endocrine and metabolic disorders from Korea National Institute of Health (NIH). Director-General Park presented on “Supporting Plans for the Biomedical Research by the Ministry of Health and Welfare and Role of Korea NIH”. The event offered six invited keynote lectures, along with a brief overview of the biomedical research centers, located at UNIST, Pusan National University, and Dong-A University. The forum also addressed current trends and future policy directions of biomedical industry in the south eastern region of South Korea. This special forum on biomedical science is scheduled to be held twice a year. It will explore possible research and educational collaborations within the field of biomedical science, together with local governments and key business stakeholders.